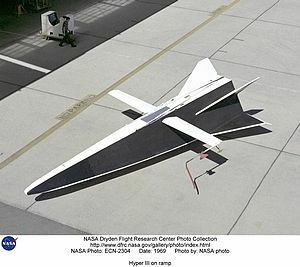 The NASA Hyper III was an American unpowered full-scale lifting body remotely piloted vehicle designed and built at the NASA Flight Research Center at Edwards Air Force Base, California. The Hyper III was designed to help in the M2 lifting body program, it had a flat bottom and sides and a simple straight wing with no flaps, ailerons or any control surfaces. The wing was designed to simulate a pop-out wing that had been proposed for a re-entry vehicle. It had twin fins and rudders canted at 40� from the vertical with hinged elevons on the horizontal surface. The landing gear was a fixed tricyle type, using spring steel legs from a Cessna aircraft. It was fitted with an emergency parachute system and the aircraft was controlled by 5-channel radio link, instrument data was down-linked using a 12-channel radio. On the 12 December 1969 the Hyper III was launched from a helicopter at 10,000 feet. It glided 5 km, turned round, came back and landed. After the three-minute flight it was not flown again as the Center cancelled the program.